With beautiful sunny weather bathing the island, Harrison grabbed the early lead at Glen Helen on the opening lap, his advantage over Hillier just half a second as Cowton slotted into third ahead of Jamie Hamilton, Olie Linsdell and Keith Amor. There was disappointment though for Ivan Lintin, the fastest qualifier, as he only got as far as Union Mills before retiring. As the lap progressed, the gap between the front two was increasing all the time and with a first lap speed of 117.897mph, Harrison already had a comprehensive lead of almost ten seconds. Hillier had extended his gap to Cowton too, the margin now 8.4s, as Amor, Hamilton and Linsdell continued to hold onto their top six places but another pre-race favourite Lee Johnston was another early retiree. The majority of riders opted to pit at the end of the first lap but one man who didn’t was double Manx GP winner Michael Russell and the leaderboard took on a different look through Glen Helen on lap two. Harrison still led Hillier by ten seconds but Russell was now up to third, just two seconds behind Hillier but only half a second clear of Cowton. It was clear that it wouldn’t be until Glen Helen on lap three that the leaderboard would settle down again after all the pit stops had been made but at the end of the lap the order was Harrison, Hillier, Cowton, Amor, Hamilton and Russell. Russell then pitted but his race was over shortly after when he pulled in at Quarterbridge. 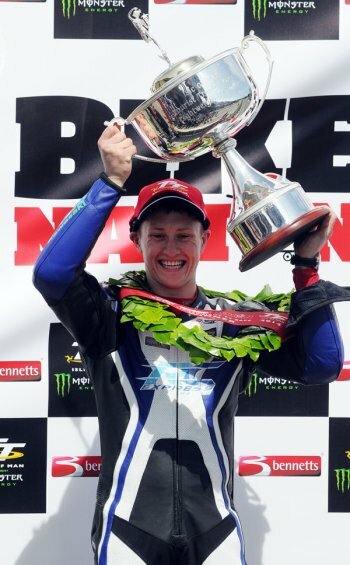 By Glen Helen on the third and final lap, Harrison’s lead had now risen to 18 seconds although Cowton was only four seconds adrift of the 2013 race winner. Amor, Hamilton and Linsdell remained in fourth, fifth and sixth as Harrison, Amor and Hamilton circulated in close formation. The Bradford rider was able to control the race in the closing stages and he took the win by 14.6s to emulate the feat of his dad Conrad in Saturday’s opening F2 Sidecar race, the first time a father and son have taken wins in the same week. Hillier was secure in second and took his third podium in the class in as many years, with 2012 Newcomers Manx GP winner Cowton having a superb ride into third. Amor, Hamilton and Linsdell had no dramas on the final lap and filled out the top six. 2012 race winner Ryan Farquhar took seventh ahead of Dan Cooper, Michal Dokoupil and newcomer Martin Jessopp who had a great ride into tenth. 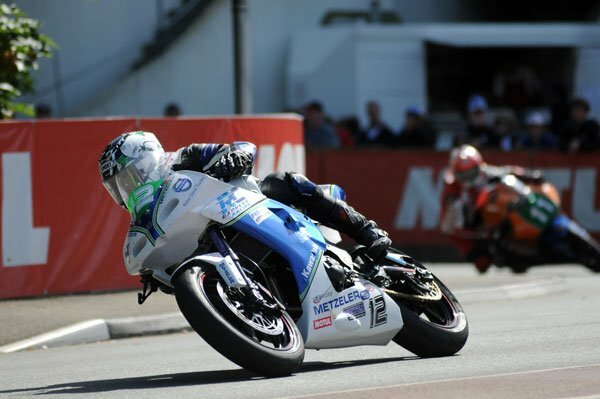 Fellow debutante Danny Webb was only two further places back in twelfth.